What is in a name? Environmental Justice (EJ) may not mean exactly what you think it does! Environmental Justice (EJ) has a slightly misleading name. It is more of a social justice and fairness concept. 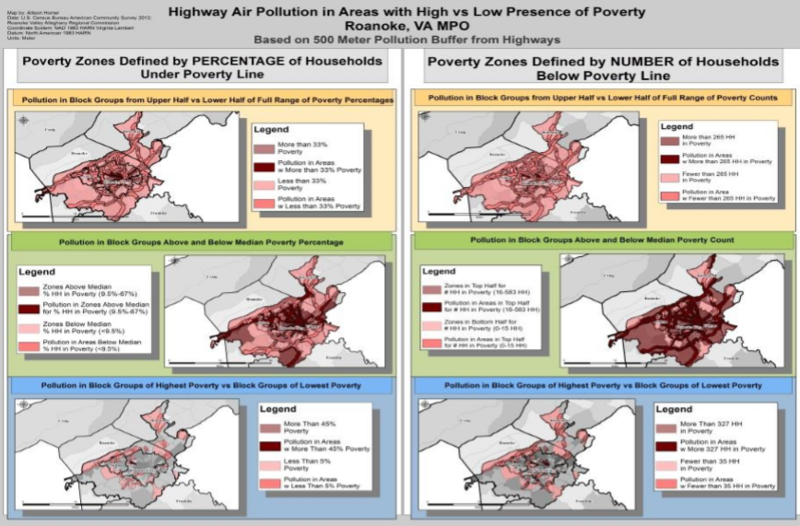 It does have a connection to the physical environment through emphasizing that traditionally underrepresented communities, low-income and minority communities, should not be adversely affected by disproportionate exposure to pollution, or other adverse impacts, from transportation projects. However, the central meaning behind EJ is more about not disrupting the social fabric, cohesion and development of traditionally underrepresented communities. Disruption could occur by separating communities with large thoroughfare transportation projects that don’t directly serve the communities and may serve as barriers. At its core EJ seeks to learn from the mistakes of the “Urban Renewal” era of the 1960s and 70s in which vibrant and successful urban neighborhoods were divided by freeways and highways subsequently harming the economic health and social fabric of the neighborhoods. More information about the official history of the EJ concept with its origins in Title VI of the Civil Rights Act of 1964 and Executive Orders 12898 and 13166 in the late 90s and early 2000s can be found in the RVTPO Title VI, Environmental Justice and Limited English Proficiency (LEP) Plan. When RVTPO implements long-range plan by applying for SMART SCALE High Priority funding (the Virginia Prioritization and Programming system) over successive application cycles. SMART SCALE is the effective link between the long-range transportation plan and the Transportation Improvement Program (TIP). These two levels, separated in time, allow us to use a “canary in the coal mine” approach in the long-range plan. The EJ Framework will primarily identify red flags and screen out any patently inappropriate projects from the long-range plan. Later, before projects are actually applied for in SMART SCALE, we can use the framework again, in a more robust manner, to modify the scope of the SMART SCALE application to address any additional EJ concerns that arise. In order to evaluate EJ impacts, both positive and negative, we will use our new EJ Benefits and Burdens Framework that was developed for the RVTPO in the form of a Master Degree Thesis by Allison Homer at Virginia Tech. We are fortunate to have this up-to-date framework that can incorporate new tools such as the Environmental Protection Agency’s EJSCREEN and go beyond these tools for a robust planning level implementation of EJ concepts. Please look forward to more news on the applying EJ through the new Constrained Long-Range Multimodal Transportation Plan 2040 in the coming months. This entry was posted in Blog, Transportation and tagged Long-range transportation plan, long-range planning, Environmental Justice, EJ, social justice on June 16, 2016 by admin.